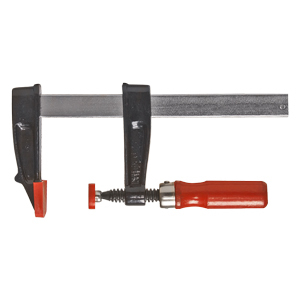 Bessey LM Light Duty Bar Clamps have 2" deep zinc die cast jaws, serrated rails for slip resistant grip and non-marring plastic caps. They can handle up to 330 lbs of clamping pressure. New economical Bessey F-Style clutch bar clamps come with cast heads with powder-coated finish to resist corrosion and chipping. 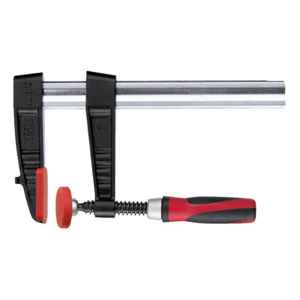 Bessey provides a zinc finished rail with a two piece clutch plate system for opening and closing the lower movable jaw. 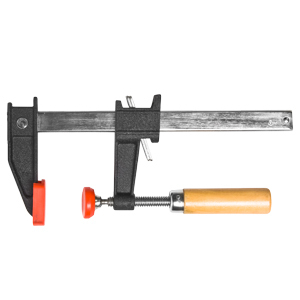 The Bessey clutch clamps are also provided with protective pads on both the top and bottom jaws and come with a comfortable wooden handle. Bessey's simply unequalled, proven clamp design has made it the choice of professionals worldwide. 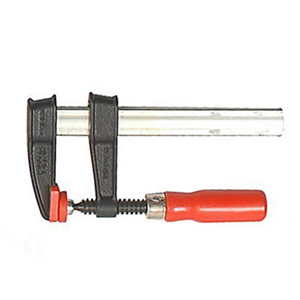 Tradesmen bar clamps are fast action, high quality sliding arm bar clamps. These clamps feature a patented profiled rail, I beam design that minimizes the flexing or bending common with flat bar rails, patented non-slip locking device, zinc-finished drawn rail to prevent black marks from appearing on wood, protective non-marring pads, and a comfortable ergonomical grip wood handle. Bessey's simply unequalled, proven clamp design has made it the choice of professionals worldwide. 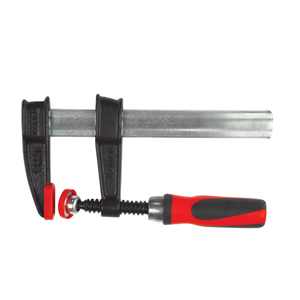 Tradesmen bar clamps are fast action, high quality sliding arm bar clamps. These clamps feature a patented profiled rail, I beam design that minimizes the flexing or bending common with flat bar rails, patented non-slip locking device, zinc-finished drawn rail to prevent black marks from appearing on wood, protective non-marring pads, and a 2K Comfort Grip handle. 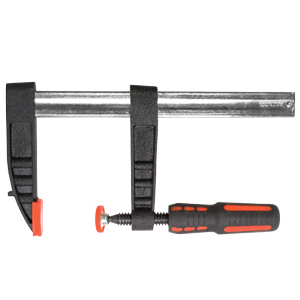 Nine times faster than a C clamp, Bessey's Light Duty Tradesmen Bar Clamp is simply unequalled. The choice of professionals worldwide, this fast action sliding arm bar clamp features a profiled rail and I-beam design that minimizes flexing and bending common with flat bar rails. A patented non-slip locking device and zinc-finished, drawn rail prevent marring and staining of the work piece. The ergonomically designed 2K Comfort Grip Handle gives you positive strong clamping power. Galvanized metals eliminate stains and rust. Bessey's cold drawn profiled steel rail offers total control over the work piece. The built to last clamp is corrugated for extra strength, and powder coated for protection against corrosion. A uniquely designed setscrew is permanently molded into the sliding arm, and interlocks with serration on six sides of the rail provide the ultimate non-slip grip. Nine times faster than a C clamp, Bessey's Medium Duty Tradesmen Bar Clamp is simply unequalled. The choice of professionals worldwide, this fast action sliding arm bar clamp features a profiled rail and I-beam design that minimizes flexing and bending common with flat bar rails. A patented non-slip locking device and zinc-finished, drawn rail prevent marring and staining of the work piece. The ergonomically designed 2K Comfort Grip Handle gives you positive strong clamping power. Galvanized metals eliminate stains and rust. Bessey's cold drawn profiled steel rail offers total control over the work piece. The built to last clamp is corrugated for extra strength, and powder coated for protection against corrosion. A uniquely designed setscrew is permanently molded into the sliding arm, and interlocks with serration on six sides of the rail provide the ultimate non-slip grip. 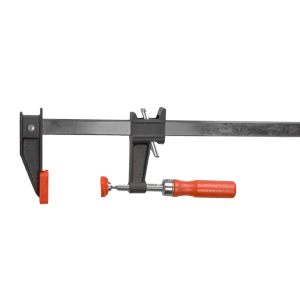 Our Heavy duty F-clamp is built with a zinc plated steel bar and cast steel head / jaw. All 3 size clamps have a 4" reach and the handle has a soft grip for more grip and better clamping force. Removable pads provide grip on work surfaces and reduce work piece marring. 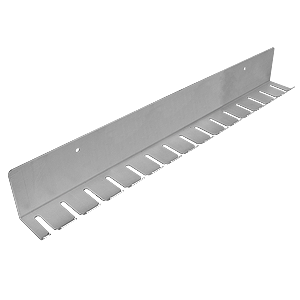 Grooves in the serrated bar allow easier sliding of moving jaw. Light Duty F-Bar Clamps have 2-1/2" deep zinc die cast jaws, serrated rails for slip resistant grip and non-marring plastic caps. These F-clamps have a 2-3/4” reach. Used by home crafter's, cabinet-makers, and woodworkers alike. 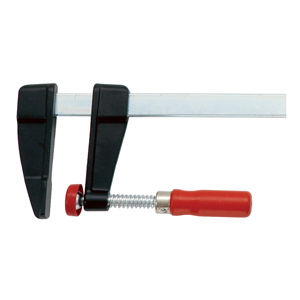 These easy to open and close clamps are suitable for “close quarters” clamping. The Multiple- Disc-Clutch holds securely at any point along the steel bar of the clamp. Over 500 lbs. of clamping pressure. The ideal clamp set to get you started! In the woodworking industry it has been said that you can never have too many clamps. Having just the right clamp for the job can sometimes be difficult and lets be honest, it can be quite pricey. 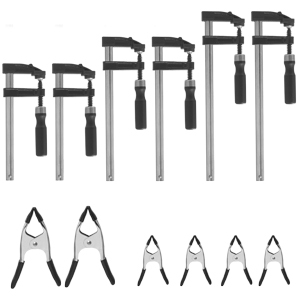 The 12 Piece Woodworkers Clamp Set is the ideal and economical way to get your workshop outfitted with quality clamps to get you started the set comes with 6 steel spring clamps and 6 F-Clamps. You receive 2 each 6", 8" and 12" F-clamps and 4 each 1" Steel Spring Clamps and 2 each 2" Steel Spring Clamps.